The Administration views shared services as a key tool for agency reform. The most common cause of underperformance typically occur in the area of governance: program and project management, requirements definition, execution oversight, and communications. Successful governance models involve collaborative partnerships between providers and customers and are characterized by shared understanding of vision, business objectives, performance incentives, roles, responsibilities and accountabilities. The Federal workforce is changing. Future employees are seeking mobile, user friendly HRIT solutions that reflect a modern user experience comparable to those in their daily lives. At the same time, the expectations of the HR function are also evolving. Agency leaders expect HR to deliver additional capabilities, high quality service, and accurate information at the push of a button. This session explored the drivers and opportunities to be gained from end-to-end, integrated HR technology – addressing the digital needs of the future workforce while enabling CHCOs and agency leaders to make critical workforce decisions that directly impact the mission. The Shared Services Leadership Coalition, the Senior Executive Association and the National Academy of Public Administration are pleased to publish a report on our 2018 Shared Services Breakfast Seminar Series titled: Shared Services: Why the Voice of the Customer Matters. The report summarizes key take-aways from the seminar series and includes 15 case studies of private sector shared services organizations conducted by the President’s Council on Management Improvement in 1982 that are still relevant today. See the full report here and a brief executive summary version here. The April 5th “Shared Services Myth Busting” workshop at the National Academy of Public Administration (NAPA) was an enormous success. The event was hosted in partnership with the Shared Services Leadership Coalition and the Senior Executives Association. Absence of the “voice of the customer” is a consistent failure in the implementation of shared services. Most shared services experiences were top down, with little or no consideration of the needs of the ultimate consumers. Size matters. Small agency needs (EEOC) are much different than large agency needs (DHS), but there is frequently no distinction made when implementing inter-agency shared services plans. Mission requirements come first. Any shared services plans that negatively affect mission capabilities are a non-starter. Examples include hiring highly technical talent at an S&T agency or impinging on DoD armed services HR functions. The different “flavors” of shared services are not known to consumers of shared services. The three categories of shared services in the PMA were new to most participants and it is evident that an education effort is required. The PMA is seen as a positive way to implement shared services. A long-term effort to implement shared services that is consistent with the goal of modernizing federal government processes was perceived as a good rationale for shared services. There are “quick wins” that could be accomplished in the very short term. These included burn centers, shuttle services, etc. The Administration views shared services as a key tool for agency reform. The most common cause of underperformance typically occur in the area of governance: program and project management, requirements definition, execution oversight, and communications. Successful governance models involve collaborative partnerships between providers and customers and are characterized by shared understanding of vision, business objectives, performance incentives, roles, responsibilities and accountabilities. The event was hosted in partnership with the Shared Services Leadership Coalition and the Senior Executives Association. As government begins to consider the implications of the President’s Management Agenda, the second of a series of breakfasts on shared services was hosted on May 2, 2018, at NAPA’s offices. At a high level, the session covered a shared services governance structure focusing on the voice of the customer, case studies of successful shared services governance structures, the development of service standards for shared services, and a discussion about grant programs and shared services. Speakers included Lesley Field, Acting Administrator for Federal Procurement Policy in the Office of Management and Budget (OMB) and Shared Services Policy Officer, and Beth Angerman, Acting Deputy Associate Administrator of the Office of Governmentwide Policy in GSA and leader of the Shared Solutions and Performance Improvement Team. A panel discussion followed on how to leverage the voice of the customer that included three executives representing different roles in the government shared services journey: Jeff Koch, Deputy Assistant Secretary for Administration and Management at U.S. Department of Labor (DOL); Tom Muir, Director, Support Services at Department of Veterans Affairs; and Rhea Hubbard, Senior Policy Analyst at OMB and a leader in the grants CAP goal effort. Ms. Field focused on the vision of the administration to put a shared services stake in the ground, recognizing that “this is a relay, not a sprint, and one that will take 10 years to complete, and will save an estimated $2 Billion.” Reviewing the cross-agency goals, she discussed the relationship between IT modernization, shifting from low value to high value work, and shared services as part of a holistic approach. Ms. Angeman discussed the Sharing Quality Services Cross-Agency Priority (CAP) Goal and the governance plan for shared services. This a comprehensive and complicated structure that starts at OMB and the President’s Management Council, and drives down to agencies and vendors. There were several revealing ideas in her presentation. Agencies themselves can decide how to start shared services by implementing: i) Technology Contracts; ii) Implementation & Integration Support Contracts; and/or iii) Help Desk and Transaction Support Contracts. There isn’t a mandate for agencies to adopt a prescribed shared service approach. According to Beth, “One size doesn’t fit all,” and it is important to listen to the voice of the customer. The dynamic is to find the right balance between choice and scale. Beth added, “I really feel like the ground is shifting” in terms of acceptance of a shared services future. Panelists brought their own experiences to the discussion, but focused on the voice of the customer. While the big ideas may come from the top, the ultimate responsibility and success hinges on the customer’s willingness to engage and transform. This is no easy task. Jesse Samberg provided a case study in shared services from his time in New York City with the Metropolitan Transportation Authority (MTA). Prior to implementing shared services, the MTA was comprised of seven agencies, each using its own basket of applications for benefits administration, payroll, timekeeping, etc. Post shared services, the MTA now uses one Enterprise Resource Planning (ERP) system, one document management system, and one customer relationship management system. All using a single point of entry for all users. Modern information technology must function as the backbone of how Government serves the public in the digital age. Meeting customer expectations, keeping sensitive data and systems secure, and ensuring responsive, multi-channel access to services are all critical parts of the vision for modern Government. Data, accountability, and transparency initiatives must provide the tools to deliver visibly better results to the public, while improving accountability to taxpayers for sound fiscal stewardship and mission results. Investments in policy, people, processes and platforms are key elements of this transformation and require cross-agency cooperation to ensure an integrated Data Strategy that encompasses all relevant governance, standards, infrastructure and commercialization challenges of operating in a data-driven world. The Workforce for the 21st Century must enable senior leaders and front-line managers to align staff skills with evolving mission needs. This will require more nimble and agile management of the workforce, including reskilling and redeploying existing workers to keep pace with the current pace of change. The management agenda looks to these 3 “Priority Goals” to drive the overall change described in the PMA. There are a total of 14 CAP Goals including the above 3. Each goal identifies leaders who will be responsible for implementing the goals, and includes specific target objectives and dates. What is most interesting and important about the PMA is the way that these goals intersect with one another across agencies, functions, leadership and outcomes. This is an enterprise view of the workings of government, and the PMA is a means toward finding enterprise solutions. One critical enterprise solution relates to the CAP Goal; Sharing Quality Service (“SQS”). Shared Services is the consolidation of technology, operations and/or people within the same organization, or across organizations. Shared services are cost-efficient because they standardize and centralize back-office operations, and eliminate redundancy. Along the road to considering many of the above goals, it is in the interest of the government as a whole, as well as individual agencies, to consider whether a shared service operation can facilitate various of the other goals. One of the improvements upon previous shared services efforts is the inclusion of a Governance and Operating Model. The Model has several levels of responsibility starting with the President’s Management Council (“PMC”) setting overall strategy, down to vendors providing services. The SQS model has several “flavors” of shared services; Technology Contracts; Implementation and Integration Support Contracts; and Help Desk and Transaction Support Contracts. These common solutions deliver services to the Federal government that enable the SMO to scale, innovate, and help drive standardization and cost reductions in mission support functions. Who is Ready to Move? Based on these satisfaction polls, we need to focus on the coalition of the willing in order to build a shared services movement. Many of those who attended our breakfast series are in our corner. A guiding principle of this process is “one size doesn’t fit all.” While there is an imperative to become more efficient by adopting a shared service model, agencies have the option of taking one or more of the above referenced “flavors”. This is a critically important notion that recognizes the complexity of government technology, requirements, workforce, etc. Large agencies may be better served by building a shared service operation within, while smaller agencies would migrate to a Federal Shared Service Provider. In any event, so far that decision is being left to the agency. The President’s Management Agenda views shared services and solutions as key tools for agency reform. Today, leading firms in the private sector use a full-service shared services model for financial management that is driving increasing efficiency gains through innovation and automation. However, the Federal Government lags behind the private sector and experiences significant challenges when trying to replicate commercial best practices. Accomplished: Discussed “Fiscal Accountability: Financial management shared services models, best practices, and challenges” with approximately 70 government and industry professionals. Heard from 3 OCFO leaders on their shared services journeys from HUD, Depart of State, and Depart of Justice. We propose recommendations to OMB that will enable agencies to accomplish administration priorities. There is resistance to new processes and ways of conducting business. Recommend ample advanced notice and focused change management practices to increase success of adoption. Promote Reimagine efforts across cabinet agencies on how to tackle inefficiencies. Establish target goals and further internal standardization and consolidation efforts. Providers of service should migrate to customer service orientation with SLA’s and feedback mechanisms like those used in commercial industry. Some agencies finding the budget cycle and process restrictive to acquiring new innovation. Recommend expanded use of multi-year funding and contracting and more flexible acquisition arrangements. Utilize tools like tight SLA’s and ability to decrease costs. Utilize right mix of public and private workforce and innovation automation to decrease gaps. The event was hosted in partnership with the Shared Services Leadership Coalition and the Senior Executives Association. As government leaders begin to link talent management and organizational success, the combination of enabling technologies and shared services has quickly become a key component of any HR transformation. In the Federal arena, both HR professionals and their program counterparts find it difficult to recruit and retain employees. This is partly due to the sharp competition of resources but it is also due to complex work processes that characterize the Federal talent acquisition process. 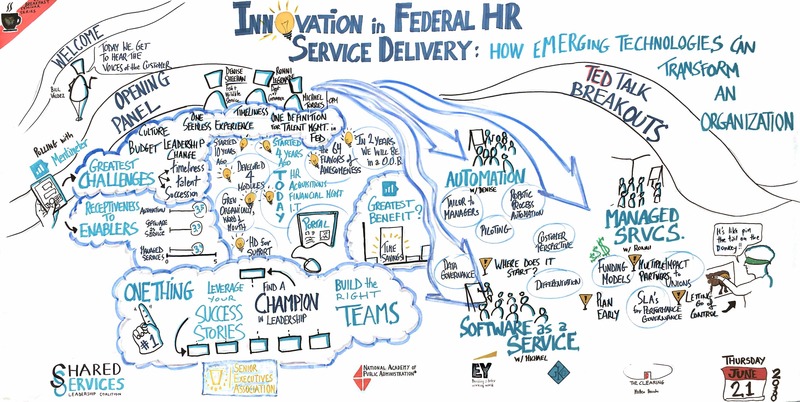 In response to these challenges, three trends in Federal HR are emerging. They include: Managed Services, Automation, and Software as a Service (SaaS). As government leaders move out to fulfill agency mission goals, objectives, and adhere to new administration priorities, the ability to successfully acquire and operate with shared services will play a vital role for long-term success. 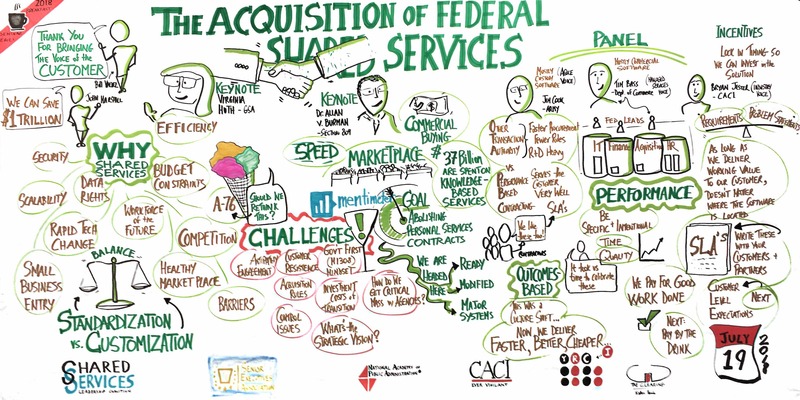 Within the Federal Government, successful acquisition of shared services requires the ability to overcome number of challenges that are often counter to traditional government acquisition contracting methods. Our highly interactive, customer centric participation seminar discussed topics including key differences between centralized services and shared services, offered best practices in defining a contractor provided shared service delivery model, and provided updates related to the Section 809 acquisition reform. Federal organizations are changing the way they work. Through adoption of digital workforce capabilities, process robotics, cognitive technologies, crowdsourcing solutions, and other emerging technologies, the nature of how government work is executed is changing. By including more innovation into their workstreams, government organizations will become more impactful and productive, increase decision-making capabilities, and better support the overall well-being of their employees. This will have a profound impact on how Federal Organizations execute their mission and how Shared Services Organizations meet customer needs. These disruptors are already reshaping the way government and industry perform work, the workforce doing the work, and the workplace where work takes place. The Federal landscape is beginning to address these changes, and will need to stay abreast of emerging technologies, understand their impact, and adapt their delivery and operating models. These innovations will continue to influence the way in which shared services organizations operate and serve the government, both internally and externally. William Eggers’ keynote presentation showed how many labor-intensive, repetitive tasks are highly amenable to automation. Automating certain tasks could save billions of dollars and free up millions of hours across the federal workforce. This does not simply mean removing these jobs from the labor force, but to reimagine the workforce, by: (1) matching workers to work; (2) creating networks of teams; and (3) crowdsourcing tasks. Sample scenarios were given around each of these areas during the presentation. Eggers also highlighted research that quantified the immense return on investment, from both a time and financial savings perspective that the Federal Government could achieve by leveraging Artificial Intelligence (AI) to transform the nature of work. This is the sixth in a series of seminars exploring major challenges in the areas of human capital leadership, governance innovation, fiscal accountability, acquisition and emerging technologies as they relate to shared services. The objective of the series is to enhance the government’s understanding and execution of shared services as mission-enhancing value drivers in Agency Reform Plans.